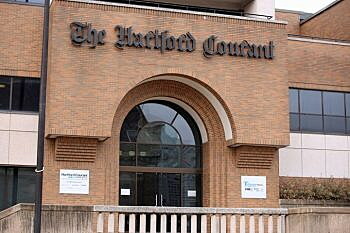 HARTFORD, Conn. (CN) — The Hartford Courant, Connecticut’s oldest continuously published newspaper moved Monday to form a union. More than 75 percent of the newsroom, which has been ravaged by buyouts and layoffs over the years, have signed cards signaling their desire to be represented by the Hartford Courant Guild. The group will become a unit of the Providence Newspaper Guild, a local chapter of The NewsGuild-CWA, the nation’s largest union for journalists and other news industry employees. Tim Knight, Tribune’s new CEO who stepped into the role less than a month ago, was in Hartford Monday having lunch with Courant publisher Andrew Julien and newsroom staff. Julien did not immediately respond to an email seeking comment on the organizing effort. Relieved to have their efforts out in the open, reporters were sporting union pins Monday. The union-organizing drive comes amid continued turmoil at Tribune Publishing, which has been the focus of sales. The company terminated negotiations in December to sell the newspaper chain to the California-based McClatchy Co. The union campaign at the Courant is part of an upsurge in NewsGuild organizing drives in newsrooms across the country. It follows similar successful efforts at the Los Angeles Times and the Chicago Tribune.